Peel, chop and wash the leek. Drain in a sieve, then cook in a saucepan on a medium heat for 10 mins with butter, salt and pepper. Cut 2 generous slices of Brie au Bleu ILE DE FRANCE® then cube the remainder. Cut the salmon into small pieces. Beat the eggs in a bowl with cream, salt and pepper. Line 4 small pie dishes with the pastry. 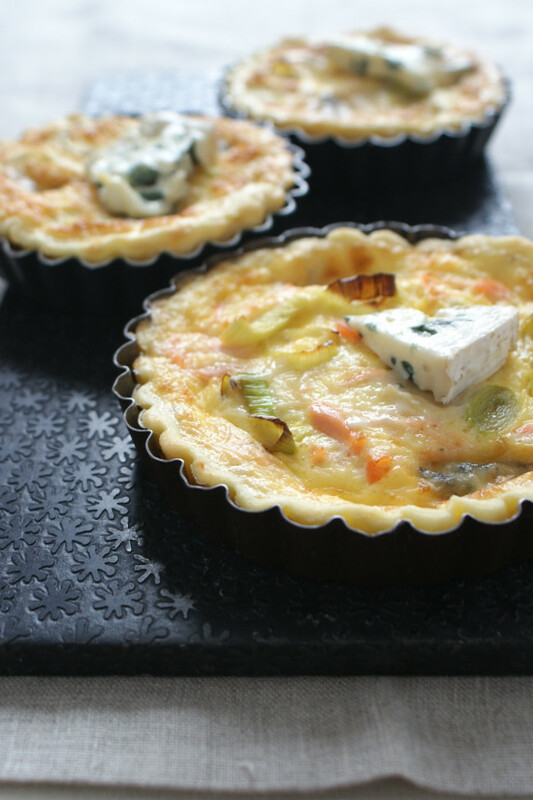 Spread the simmered leeks, the Brie au Bleu ILE DE FRANCE® cubes and salmon over the base of the pie dishes. Pour over the cream, then place ½ a slice of Brie au Bleu ILE DE FRANCE® on top. Bake the tarts in the oven for 20-25 mins. Remove the tarts from the oven and allow to cool slightly before serving.